Whirlpool 36-inch Wide French Door Refrigerator with Crisper Drawer - 25 cu. 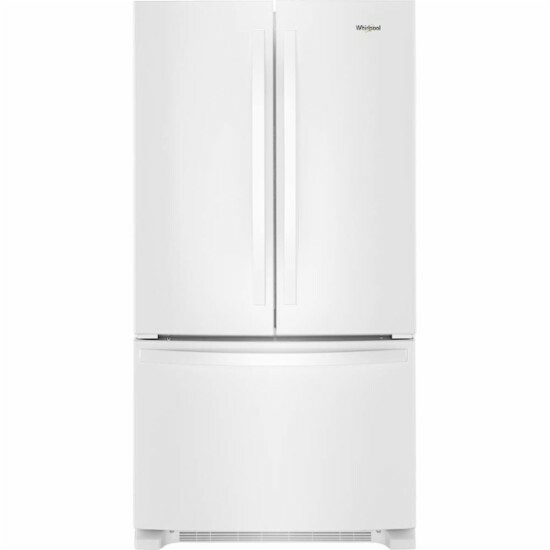 ft.
Get the storage you need in this ENERGY STAR certified refrigerator. The produce preserver helps produce stay fresher longer while crisper drawers give you the room to store fruits and veggies in the ideal environment. Not only does this refrigerator with glass shelves have a crisper drawer, it has LED lighting to keep food looking as great as it tastes. Keep fruits and veggies in the ideal environment to help produce stay fresher longer2 . Store wide items like party platters and sheet cakes, and manage the temperature with manual controls. Free up shelf space by storing gallons of milk and other containers in the door. Cool food quickly with technology that senses and adapts to create the ideal environment for food.